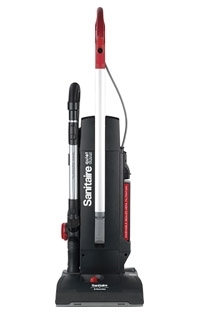 Durable, versatile, maneuverable and easy t o maintain, this Quiet Clean 4 quart sealed-HEPA upright with patented telescopic wand is a CRI and LEED certified workhorse that makes cleaning carpets and bare floors effortless. The disposable dust bag system and 50-foot Quick Change cord make for simple maintenance. CRI and LEED certified, 2-motor, 4-qt. bagged upright with QuietClean/Normal flip switch. 100% of air is filtered at a rate of 99.97% at 0.3 microns, and filter is washable for cost savings. Patented, chrome telescopic wand with permanently attached retractable dusting brush. 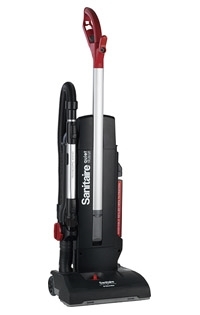 The 50-foot quick change cord and 13-inch cleaning path make quick work of big jobs.